Our events are run at Melville Park. Competitions provide a great opportunities for our dogs and handlers to test themselves against others from all around New Zealand. Club members compete regularly at events throughout the North Island. WAG also hosts three events per year. Championship Events are pre-entered and allow dogs to gain titles recognised by the New Zealand Kennel Club. Ribbon Trials are more informal events that members can enter on the day. These are often the first stepping stone into competitions. We welcome spectators to our events to get a taste for what agility is all about. 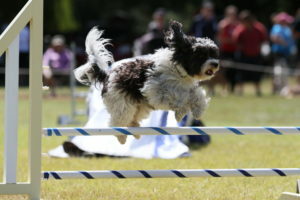 Being based in a central metro area, WAG’s events are well attended from competitors throughout the North Island.